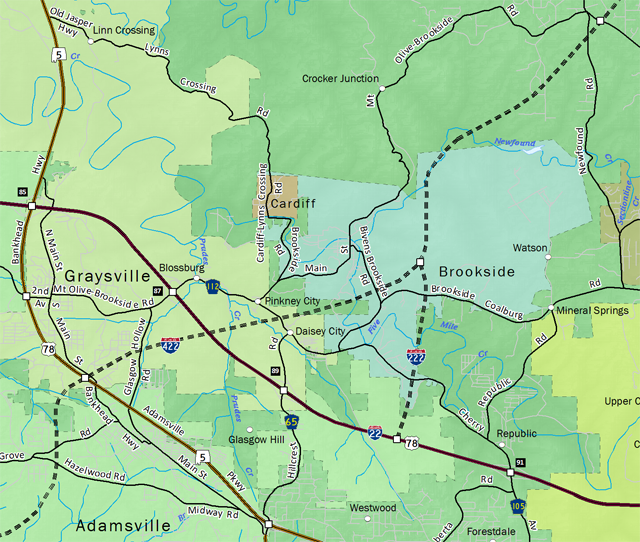 Interstate 222 is a proposed 2.26-mile long freeway linking I-422 (Birmingham Northern Beltline) with I-22 east of their crossing in Graysville. Due to terrain and other environmental issues, a direct interchange between Interstate 22 and I-422 will not be constructed. Instead I-222 will provide connections between the two routes, tieing into I-22 midway between Exits 89 and 91. 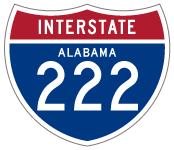 ALDOT petitioned AASHTO for the Interstate 222 designation on September 27, 2011 in conjunction with an application for Interstate 422. This was approved by the AASHTO Special Committee on US Route Numbering (SCOH Committee) on May 18, 2012. Right of Way acquisition for the stretch of I-422 between U.S. 78 and Mt. Olive Road (County Road 77) was initially anticipated for 2024 with potential construction in 2026.1 That stretch includes the interchange with Interstate 222. “Corridor X/ I-65 interchange construction could begin this year.” Birmingham News (AL), May 26, 2009. Page Created July 1, 2012.